Improper measuring is probably the number one reason recipes fail. Flour is crucial to the structure of baked goods; if you add too much flour your product will be tough and dry. If you use too little flour, your product will collapse when it comes out of the oven ​and have wet spots and dense layers. In Europe, flour and most ingredients are measured by weighing. That is the most accurate way to measure any ingredient. But if you don't want to do that, you can get accurate measurements by buying calibrated measuring utensils and using them correctly. To correctly measure flour, use a spoon to lightly scoop flour out of its container into a measuring cup. Do not scoop the measuring cup into the flour. Continue spooning the flour into the cup until the cup is overflowing. Then use the back side of a knife to level off the flour even with the top edge of the measuring cup. Repeat as necessary, with 1 cup, 1/2 cup, 1/3 cup, and 1/4 cup measures. Be sure to look at my Step by Step: Measuring Flour Correctly for best results. 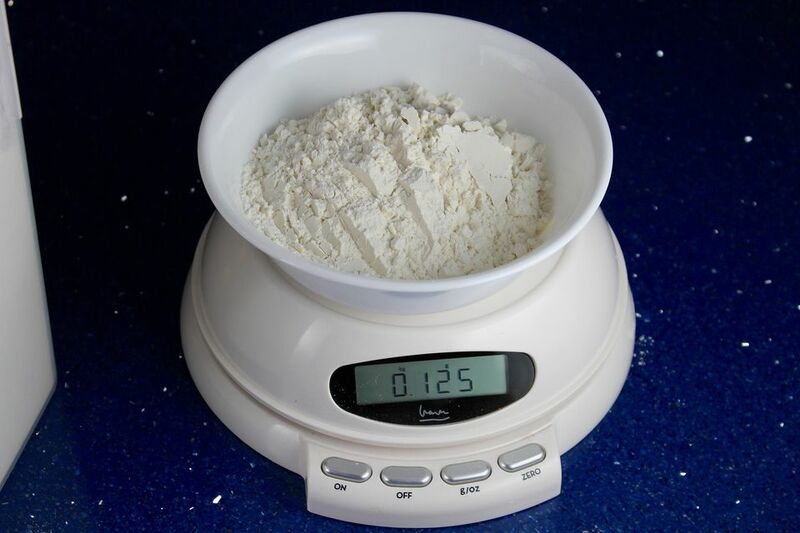 For the most accurate flour measuring, you can weigh the flour on a kitchen scale. This is what home economists do when they are testing recipes before publication. It's the way Nigella Lawson always measures her flour on her TV show! One cup of white flour weighs 125 grams. One cup of whole wheat flour weighs 140 grams. One cup of bread flour weighs 130 grams. One cup of cake flour weighs 114 grams. The most common mistake made in measuring flour is to dip the measuring cup into the flour instead of lightly spooning flour into the measuring cup. This can result in up to 25% more flour than the recipe calls for. I see this all the time on television cooking shows. You can tell when a cook has used too much flour; cookies are hard and dry, cakes are tough, and sauces are too thick and can be pasty. To see this for yourself, measure 3 cups of flour into a bowl by scooping the flour with the measuring cup. Then stir the measured flour, and re-measure by lightly scooping with a spoon. When you have measured 3 cups this way, how much flour is left in the bowl? This extra flour will make your baked products heavy and tough. So remember to measure by lightly scooping with a spoon!